The Delhi Fort, also known as Lal Qil'ah, or Lal Qila, meaning the Red Fort, located in Delhi, India, has been awarded the UNESCO World Heritage Site designation in 2007. The Red Fort served as the palace for Mughal Emperor Shah Jahan's new capital, Shahjahanabad, the seventh Muslim city in the Delhi site. The Red Fort has become a symbol for Indian independence from British rule, with the Prime Minister addressing the nation from the Red Fort every Independence Day, August 15th. That is remarkable when considering that India, predominately Hindu, has chosen as a symbol for national unity a Fort of Islamic architecture. That is fitting with India's commitment throughout the post-independence period of bringing Hindu, Sikh, Jain, Buddhist, Christian, and Muslim together in the creation of the Republic of India. Shan Jahan moved his capital from Agra in an attempt to bring prestige to his reign, and to provide ample opportunity to fulfill his ambitious building schemes and interests. 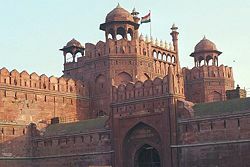 The Red Fort stands at the eastern edge of Shahjahanabad, receiving its name from the massive wall of red sandstone that defines its four sides. The wall stands 1.5 miles (2.5 km) long, and varies in height from 60 ft (16m) on the river side to 110 ft (33 m) towards the city. Measurements have shown that a square grid of 82 m had been used to generate the plan. The fort lies along the Yamuna River, which feeds the moats that surround most of the wall. The wall at its north-eastern corner sits adjacent to an older fort, the Salimgarh Fort, a defense built by Islam Shah Suri in 1546. Construction on the Red Fort began in 1638, finishing in 1648. Incidentally, the Ancient City of Lal Kot, captured by Shah Jahan, literally means Red (Lal) Fort (Kot). Lal Kot served the capital city of Prithviraj Chauhan in the late twelfth century. On March 11, 1783, Sikhs entered Red Fort in Delhi and occupied the Diwan-i-Am. The Mughal wazir, unified with his Sikh Allies, essentially surrendered the city, carried out by the command of the Sardar Baghel Singh Dhaliwal of the Karor Singhia misl, on the third of his three campaigns to conquer Delhi. The Red Fort had been built according to a comprehensive blueprint, and subsequent modifications had preserved the overall unity of the scheme. In the eighteenth century, occupiers and looters damaged some sections of the palace. After the Sepoy Mutiny of 1857, when the Fort served as a headquarters, the British army occupied and destroyed about four-fifths of its pavilions and gardens. A program for restoring the surviving parts of the fort began in 1903. The Diwan I Khas, or Hall of Private Audiences. The walls of the fort have a smooth design, articulated by heavy string-courses along the upper section. They open at two major gates, the Delhi and the Lahore gates. The Lahore Gate serves as the main entrance, leading to a long covered bazaar street, the Chatta Chowk, lined with stalls for shops. The Chatta Chowk leads to a large open space then crosses the large north-south street that originally marked the division between the fort's military functions, to its west, and the palaces, to its east. At the southern end of that street stands the Delhi Gate. On axis with the Lahore gate and the Chatta Chowk, on the eastern side of the open space, sits the Naqqar Khana ("drum house"), the main gate for the palace, named for the musicians' gallery above it. Beyond that gate lay another, larger open space, which originally served as the courtyard of the Diwan-i-Am, the spacious pavilion for public imperial audiences. An ornate throne-balcony for the emperor stands at the center of the eastern wall of the Diwan, conceived as a copy of the throne of Solomon. The imperial private apartments lie behind the throne. The apartments consist of a row of pavilions that sit on a raised platform along the eastern edge of the fort, looking out onto the Yamuna river. A continuous water channel, known as the Nahr-i-Behisht, or the Stream of Paradise, runs through the center of each pavilion connecting them. The Shah Burj tower, at the northeastern corner of the fort, draws water from the Yamuna river. The palace has been designed as an imitation of paradise as described in the Koran; a couplet inscribed throughout the palace reads: "If there be a paradise on earth, it is here, it is here." The planning of the palace has been based on Islamic prototypes, but each pavilion reveals in its architectural elements the Hindu influences typical of Mughal building. The palace complex of the Red Fort counts among the best examples of the Mughal style at its Shah Jahani peak. The Red Fort by night. The two southernmost pavilions of the palace serve as zenanas, or women's quarters: The Mumtaz Mahal (now a museum), and the larger, lavish Rang Mahal, which has been noted for its gilded, decorated ceiling and marble pool, fed by the Nahr-i-Behisht. The third pavilion from the south, the Khas Mahal, contains the imperial chambers. Those include a suite of bedrooms, prayer rooms, a veranda, and the Mussaman Burj, a tower built against the fortress walls, from which the emperor would show himself to the people in a daily ceremony. The next pavilion, the Diwan-i-Khasis, has a lavishly decorated hall for private audiences at the ministerial level and court gatherings. The finest of the pavilions, the buidling has ornamentation with floral pietra dura patterns on the columns, and precious stones and gilding. A painted wooden ceiling has replaced the original one, that had been silver inlaid with gold. The next pavilion contains the hammam, or baths, in the Turkish style, with Mughal ornamentation in marble and colored stones. To the west of the hammam stands the Moti Masjid, the Pearl Mosque. The Pear Mosque constituted a later addition, built in 1659, as a private mosque for Aurangzeb, Shah Jahan's successor. A small mosque, with three-domes of carved white marble, has a three-arched screen steps down to the courtyard. To its north lies a large formal garden, the Hayat Bakhsh Bagh, or Life-Bestowing Garden, which two bisecting channels of water cut through. A pavilion stands at either end of the north-south channel, and a third, built in 1842, by the last emperor, Bahadur Shah Zafar, stands at the center of the pool where the two channels meet. At one time, more than 3000 people lived within the premises of the Delhi Fort complex. But after the Sepoy Mutiny of 1857, Britain captured the fort, making it the headquarters of the British Indian Army. Immediately after the mutiny, Bahadur Shah Zafar went on trial at the Red Fort. In November 1945, the most famous courts-martial of three officers of the Indian National Army was held in the fort. After India gained independence in 1947, the Indian Army took control over the fort. In December 2003, the Indian Army handed the fort over to the Indian tourist authorities. The Red Fort represents one of the most popular tourist destinations in Delhi, attracting millions of visitors every year. The fort stands in the capital of India showing how the North Indian style of fort construction differed from the South. In the South, the majority of the beautiful forts have been built on the sea beds like the one at Bekal in Kerala. In December 2000, the terrorist group Lashkar-e-Toiba attacked the fort, killing two soldiers and one civilian in an attempt to derail the India-Pakistan peace process in Kashmir. The Delhi High Court has upheld the death sentence of the Lashkar-e-Toiba militant, Mohammad Arif, from Pakistan. Six other accused people in the case, including Mohd Ashfaq's wife Rehmana Yousuf Farooqui have been acquitted by the High Court. The Prime Minister of India addresses the nation on August 15, the day India achieved independence from the British from the fort. ↑ UNESCO, Red Fort. Retrieved December 10, 2007. ↑ W. Dalrymple, The Last Mughal: Emperor Bahadurshah Zafar and the Fall of Delhi. ↑ Nandakumar Koroth, History of Bekal Fort. ↑ BBC, Red Fort death sentence is upheld. Retrieved September 13, 2007. ↑ The Statesman, Lashkar raids Red Fort, guns down 3, December 22, 2000. Pictures of the Delhi Fort (Red Fort). This page was last modified on 26 June 2015, at 15:32.